Heather Munro, pictured, from Dundee, coming up to the end of her four years at Elon University, North Carolina, finished joint 11th in a field of 90 competitors at the Mimosa Hills Intercollegiate, Morganton in North Carolina. 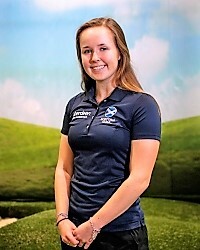 She had rounds of 74 and 75 for a total of five-over-par 145 - five behind the winner, team-mate Aurelia Hardy who had scores of 73 and 67 for 140 and a three-stroke victory. Elon University (599) finished third behind Troy (595) and USC Upstate (598) in a field of 16 teams.